WHEN a celebrity dies, everyone becomes a joker don’t they? That, or they turn into blubbing, sensitive wail-bags. Of course, both are equally irritating and understandable. So when Colonel Gaddafi got his body killed until the brains died, everyone laughed, wrung their hands and spat at the front covers of newspapers featuring his cadaver. Which did look a bit like Gene Simmons in a Shalamar wig in fairness. It’s hard not to make jokes when faced with that. Either way, no matter how quick you thought you were with your wheezes, someone beat you to it by decades. That’s right. 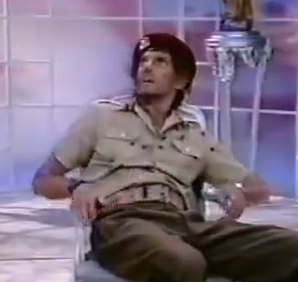 Gaddafi’s death has already been lampooned in the 1987 sitcom, Second Chance. Don’t worry if you haven’t seen it. It was pretty short-lived. It did, however, star future Friends actor Matthew Perry. Anyway, one scene from it saw Saint Peter mercilessly mocking the dictator. Judge it for yourself, here.